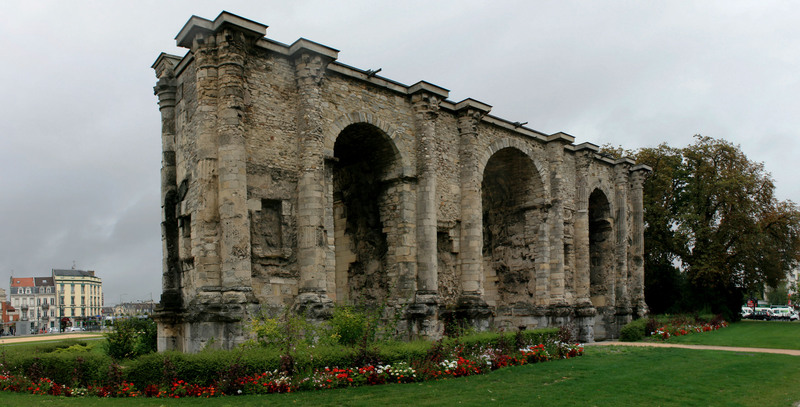 Dating to the 3rd century A.D., Porte Mars (Gate of Mars) is the widest arch in the Roman world. It is 32 meters long and 13 meters high. Named after a now gone temple to the Roman god Mars, it has many highly detailed carvings on the exterior and ceilings of the passageways. Local folklore says the inhabitants of Reims built the arch in gratitude when the Romans brought major roads through their city. It served as a city gate until 1544. In 1817, the buildings around it were removed, bringing the structure into full view.